In October we were sent images of extra long strips of Cattle Faststamps produced at Stampex, and these were followed by similar long strips of Robins from the BPMA machine. Some people suggested that the purchaser had interefered with the machine or that the long strips were produced by collusion with Royal Mail staff at the time. A video has now been loaded on YouTube showing the actual purchase at Stampex, and this is now embedded in the original post - see link above. Proof indeed that these were genuine errors. 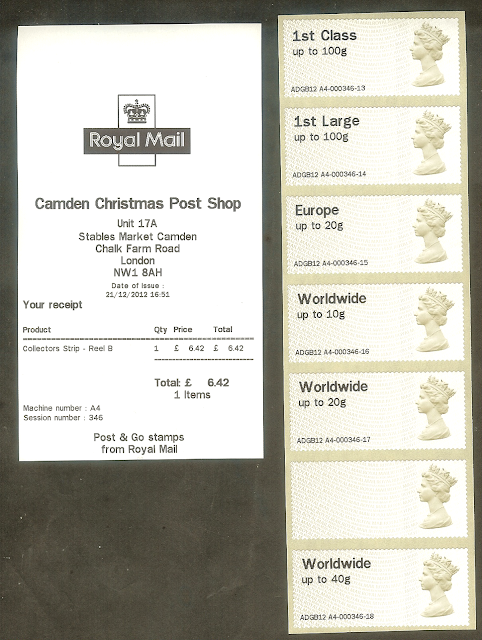 I am SO so glad that I didn't venture down the avenue of 'Post and Go' or 'Fast Stamps' (whatever)! I felt at the time that it was too open to the possibility of corruption and abuse and here we are having to PROVE that these are genuine (errors), see what I mean? What is the facination? Pray tell! ATM philately has been well established for decades on a global scale. These are/will be catalogued, bought/sold and collected. But like anything in philately - we can all choose what we collect - it's the variety that makes it endlessly fascinating - IMO. Vive La Difference! Indeed, not only are they already catalogued by Gibbons, at a very basic level, but Michel produced a worldwide catalogue of PO computer-vended postage or ATM-Marken of all sorts.